I bought a few Lao dishes for dinner and sat on the grass mat in front of the stage and shared my food with a few strangers from That Luang village and out of town people. We then watched the fashion show and it was a big hit among the crowds from all over the country. 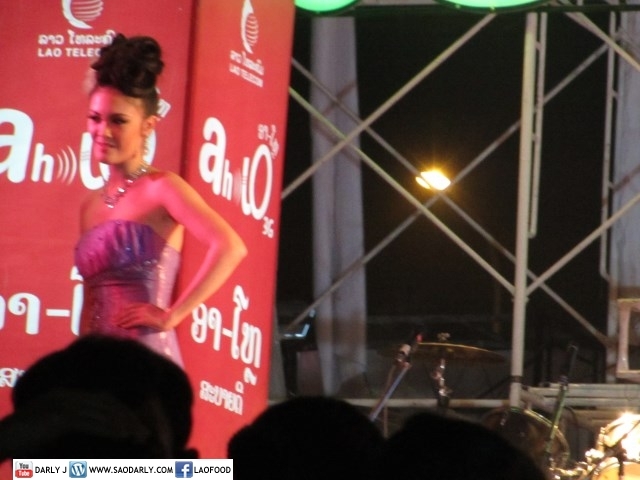 Many people were impressed by the beautiful and modern design worn by gorgeous Lao models. The center state this year was a big hit in my opinion. I attended the That Luang Festival in 2008 and enjoyed the Lao music concert but to have the Lao fashion show, promoting Lao silk and textiles is something to be proud of and quite a rare occasion for me to witness. I would definitely attend That Luang Festival annually if I could afford to attend the event. It’s never the same and being home made me feel like I never left it in the first place.